Our family’s ultimate side dish, a baked mac & cheese casserole, insanely simple but insanely satisfying, too. My Grandmama Wylie taught the recipe to Mama when she and Daddy got married back in 1963, and Mama taught it to me when I was about eight years old. My sister, Sarah, has made refinements, and I put more cheese in than anybody else in the history of the recipe, endearing me for all time to Sarah’s daughter, my gorgeous niece, Katie. And I know all my aunts and cousins have their own versions—I would happily pile my plate with any of them. We make this at all occasions of import, especially holidays. (Once we establish who’s doing the turkey at Thanksgiving, the next order of business is the macaroni pie.) I’ve got one in the oven right now because it’s Labor Day and because this would have been Mama’s 76th birthday. We’re eating takeout chicken and birthday sheet cake and macaroni pie and missing her very, very much. Spray a big casserole dish with cooking spray. Put in a layer of cooked macaroni. Cover with a thick layer of cheese. Put in another layer of macaroni, then another layer of cheese. Bake for 30-45 minutes until it’s cooked through and starting to brown on top. Let it stand for about five minutes to set, warding off with a wooden spoon any men or children who have smelled it from the living room and want to eat it NOW. This also makes pretty good leftovers out of fridge – just cut off a brick and heat it in the microwave. I haven’t posted a recipe in a while, and we ate the hound out of this Halloween night, so I thought I’d share it. I adapted it from a recipe I found on Pinterest for “Crack Potatoes,” but my niece said that just does not sound appetizing, and I suppose she has a point. Whatever you call it, it’s one of those side dishes that people can’t get enough of, great for potlucks, so very not good for you, but delicious. Make sure your heart medication is up to date and eat small portions. Spray a 9 x 12-inch casserole dish with cooking spray. In a big bowl, stir together the potatoes (still frozen; they’ll break up nicely as you stir), the bacon bits, and the cheese. In a smaller bowl, whisk together the sour cream, ranch dressing mix, and mayonnaise. Pour the dressing mixture over the other ingredients, stir them together—put your back into it; you want everything evenly distributed. Spread the resulting glop into the casserole dish. If you’re lucky, you’ve remembered to do this the night before you want to eat, in which case you can cover it all up with foil or plastic wrap and stow it in the refrigerator until you’re ready to bake. This gives your hash browns time to thaw and cuts down on your baking time. But if you aren’t lucky, you aren’t screwed; it’s just going to take your casserole longer to get done. Bake uncovered in a 425-degree oven for 45-60 minutes if you started early, 75-90 minutes if you didn’t. It’s done when you have a nice, crispy brown edge all the way around and the surface looks cooked all the way across. If you’re using a clear casserole dish, you can do what I do and hold it up over your head to check and see if the bottom is lightly browned all the way across. Just don’t do it in front of your spouse; it makes mine extremely nervous. Serves at least eight—we had seven people for Halloween and had some leftovers. This freezes well and makes great leftovers from the fridge the next day if you have any. I’ve served mine with pretty much anything I’d serve with mashed potatoes. For Halloween we had it with “mummy dogs,” hot dogs wrapped in strips of crescent roll dough and baked. And trick or treat candy. Lots and lots of trick or treat candy. So you kittens know me around this time of year; I’m always looking for something to cook that’s either dead easy to make or makes a lot of yummy leftovers. So it thrills my soul when I discover a new dish that’s both. Yesterday morning for reasons I couldn’t begin to fathom, I woke up craving Cowboy Soup. Remember Cowboy Soup? If like me you were a Girl Scout in the 1970’s, it’s a pretty fair bet you ate it at least once, a thick soup/thin stew with hamburger meat and beans and macaroni that not even too many underage cooks dancing around an open campfire can spoil. So anyway, I took to the internet and found several different recipes, and from mashing them together and elevating the grown-up snob appeal of a few of the ingredients (a few more fresh veggies and spices, a few less cans), I came up with this. And I’ve gotta tell you, it was dang tasty. My hubs and Dad both had two bowls full, and I have enough leftovers for at least one lunch stashed in the fridge. Brown ground chuck in a big soup pot over medium-high heat until no pink remains, drain and set aside. Add oil to the pot and reduce heat to medium; sauté onion, jalapeno and garlic until the onion is soft. Add tomato puree, diced tomatoes and peppers, black beans, baked beans, chicken broth, and ground chuck, bring to a boil. Add corn, brown sugar, condiments, and spices, reduce heat and simmer for at least 30 minutes. You can add COOKED AND DRAINED macaroni (1/2 pound dry) just before serving if you want it more like the Girl Scouts version. I served mine sans pasta and with cornbread, and the hubs and I each added dollop of sour cream to our bowls to mellow out the heat a bit. If you wanted it hotter, you could leave the seeds and ribs in your jalapeno; if you want it less spicy, you could leave the pepper out altogether. With the number of hotlines, websites, recipes, chat boards, and support groups available, you’d think cooking a Thanksgiving turkey was a task roughly akin to landing an airplane while juggling knives as monkeys throw cigarette butts at your face. It’s not. I swear before the throne of glory, it is one of the easiest things to cook in the world. I once wrote very similar instructions on the back of an envelope for my brother-in-law, and he produced a bird that would have looked at home in Martha Stewart’s house. Trust me; you can do this. If you go to Food Network’s website or one of the bazillion other more informative, cuisine-specific blogs on the internet, you’ll read all about stuff like brining and barbecuing and how if you’re going to fry your bird, you’ll need 300 gallons of peanut oil and a fireman with a sense of humor. I have nothing but love and respect for those writers, and I’m sure all their information is spot-on correct. But they’re making things hard on themselves and you; they’re cooking exotic gourmet turkey for the kind of discerning palettes that think of nothing of putting truffle oil on popcorn (or people who believe it ain’t food unless you deep fry it). And if you’re that person or want to cook Thanksgiving dinner like that person, by all means, go ahead. Me, I’ve got better things to do. So here’s how to make a totally basic, totally old-fashioned, roasted Thanksgiving turkey. It is quite juicy (not dry as the briners insist it will be) and flavorful (not bland as the deep fryers would expect). We serve ours with dressing (not stuffing), rice and gravy, cranberry sauce, macaroni pie, green bean casserole, rolls, and way too much dessert. And I defy you to find a better holiday feast. One turkey, whatever size you need to feed your crowd. I usually get the biggest one I can find. And if it’s frozen, put it in the fridge RIGHT THIS SECOND to thaw – seriously, if you want to eat it for lunch on Thursday, you need to have it thawing in the fridge by mid-afternoon on Sunday at the latest. 1/2 to 1 cup of water, depending on the size of the turkey. If it’s a small one, 1/2 cup. If it’s the biggest one in the store, 1 cup. A few days before Thanksgiving: Thaw the turkey in the refrigerator. If you missed this step, you can thaw it in the sink in COLD water in a few hours, but be very careful to wash your hands before and after you handle it. NEVER use warm water. Nothing ruins Black Friday shopping like a family-wide case of the runs. The day before Thanksgiving: Check and see how much your turkey weighs and read the instructions with your browning bag to see how long it will need to roast. You’re going to want to have it out of the oven at least 45 minutes before you eat, so plan accordingly. Move the oven rack to the lowest position and turn on the oven to 350 degrees to preheat. Put the tablespoon of flour in the browning bag, hold the end closed, shake vigorously to coat the inside of the bag with flour. Put the bag in the roasting pan with the open end facing out. Put the bird in the sink. Take the wrapper off. Reach inside the body cavity and remove the bag of giblets and the neck. This is the part the lady in that turkey hotline commercial calls putting her hand in the what and pulling out the what-what. (And yes, I laugh every time–she’s awesome.) But it’s not that big a deal. If you can’t bear the notion of putting your hand inside a hollow dead bird, wear rubber gloves. If you can’t stand it even then, eat at Denny’s. Rinse the bird thoroughly with cold water, pat dry with paper towels. Peel and thickly slice the biggest onion. Arrange the slices on the “floor” of the roaster inside the bag. Wash the celery and lay it on either side of the onions. This makes a kind of baking rack inside the bag. Smear about 2 tablespoons of the butter on the outside of the bird. Put it in the bag with the legs pointing toward you (so you still have access to the what). Sprinkle your herbs, salt and pepper all over the bird. Peel the other onion and put it and the rest of the butter inside the bird. Pour in the water. Put the bird in the oven and wait. Time it by the instructions in your browning bag. Professional chef type people will tell you that you simply must insert a meat thermometer through your bag into the fleshiest part of your bird (between the leg and the thigh or in the thickest part of the breast) without touching bone and cook it to an internal temperature of 165 degrees. I’m sure this is excellent advice. I don’t own a meat thermometer and never have. I time the sucker, and I also have a child’s foolish faith in the little plastic pop-up thermometer with which many birds are already skewered when you buy them. I have never had a turkey be underdone or overdone. Do with that information what you will. Let it rest for at least half an hour after you take it out of the oven before you move it to a serving platter and slice it. Strain the copious juice left in the roasting pan and use it to make dressing and gravy. I’ve added the “recipe” for making cornbread from a mix at the bottom just so you can see what you’ll need – this soup is best with freshly baked buttermilk cornbread. At least an hour before you want to eat, brown ground beef with minced onion in a large, heavy pot. Drain fat, return to the pot. Add tomatoes, water, chicken broth, bouillon cubes, potatoes, frozen vegetables, thyme, salt and pepper. Cover and bring to a boil. Simmer vigorously for at least 45 minutes. Melt butter in the microwave, stir in cornstarch until smooth. Add to the soup and stir in thoroughly. Reduce heat and simmer gently for about 10-15 minutes longer. Serve with cornbread, go to bed warm and full, sleep like a rock. Heat oven to 450 degrees. Spray an 8- or 9-inch cast iron skillet with cooking spray, put it in the oven to warm for about eight minutes. Beat egg in a medium-sized bowl. Add milk, oil, and cornmeal, beat until smooth. Batter should pour easily; if it doesn’t, add a little more milk, just a splash. Pour batter into skillet, bake 20-25 minutes. Turn out on a plate and slice into wedges. Some people butter and dip; I just crumble mine up unbuttered into my soup. If you have any leftovers, this is also really good for breakfast the next morning buttered and toasted under the broiler. Just slice each wedge open like you would to butter it, open it up, butter each piece, and put it under the broiler for about a minute until it browns. One of the good things about the retail godlings rushing us into the Christmas season early is the early appearance of Christmas hams in the grocery store dirt cheap. Everybody thinks cooking ham is hard. There’s a whole honey baked industry based on this myth. But I absolutely positively swear to you, it’s not. In fact, it’s so easy, I cook ham in the middle of the work week, serve it Southern classic with green beans and macaroni pie (baked mac & cheese for you foreign folk) for dinner, eat sandwiches on it the rest of the week, then make pea & ham soup on the weekend. It’s so easy, this barely even counts as a recipe. Now I know it’s possible to make this process complicated as hell. The very first ham I ever baked, I used a Martha Stewart recipe that called for everything from sliced pineapple to Manischewitz. It took all day long, and it looked beautiful – I could have easily put it on a fancy platter and set it on the table. Ever tried to carve a ham on a fancy platter on the table? This version isn’t nearly as pretty, but I promise you, it tastes every bit as good. Preheat oven to 350 degrees, move the oven racks down to the bottom two slots to create a big cavity. Line a pan big enough to hold your ham with aluminum foil. I use an old rectangular cake pan that I don’t use for anything else; cooking ham can ruin a pan if you’re not careful because of all the sticky stuff. Unwrap your ham and remove any little plastic bits the packagers thought it prudent to stick on (there’s usually a weird little cap on the end of the bone). Throw away any pre-packaged glazes that came with it – they’re sticky, messy, and taste revolting. Put the ham on its side in the pan. Halve your apple or apples and use the halves to prop up your ham in the pan – a little wobbling is okay, but you don’t want it rolling over on you as you take it in and out of the oven. Stick your cloves into the outside rind of the ham, just randomly, but you don’t need more than 12, and using exactly 12 makes it a lot easier to know you’ve gotten them all out after the ham is cooked. (Ask Lexx Christian sometime about the joy of biting into a cooked whole clove.) Drizzle on the honey. Pour the Coke over the whole thing. Cover it up with more foil and seal it up around the edges of the pan by crumpling it – you’re not vacuum packing, just holding in as much steam as possible. Put it in the oven and bake for 10 minutes per pound. Take it out, let it cool until you can slice it without it disintegrating (about 15-20 minutes), take the cloves out, and have yummy Christmas dinner food on a Tuesday night. And by the way, if you want the pretty presentation, that’s not really hard, either. After you’ve propped your ham in the pan, take a sharp knife and make a series of cuts through the rind on the diagonal about an inch to two inches apart in one direction, then the other to create a diamond pattern. Take canned pineapple slices and pin them to the ham with your cloves. Pin a maraschino cherry at the center of each pineapple ring. Drizzle with honey, bathe in Coke, and bake as above. Just seriously, when you’re serving, watch out for those cloves. UPDATE: For those who asked for a picture, I made another one of these over the holiday weekend as a birthday cake for my bestie and my niece. I also made two batches of the frosting. I put Batch #1 between the layers, then refrigerated the cake while I made Batch #2, then frosted the outside. Then I chilled the whole cake in the fridge for about an hour. Scruuumptious! 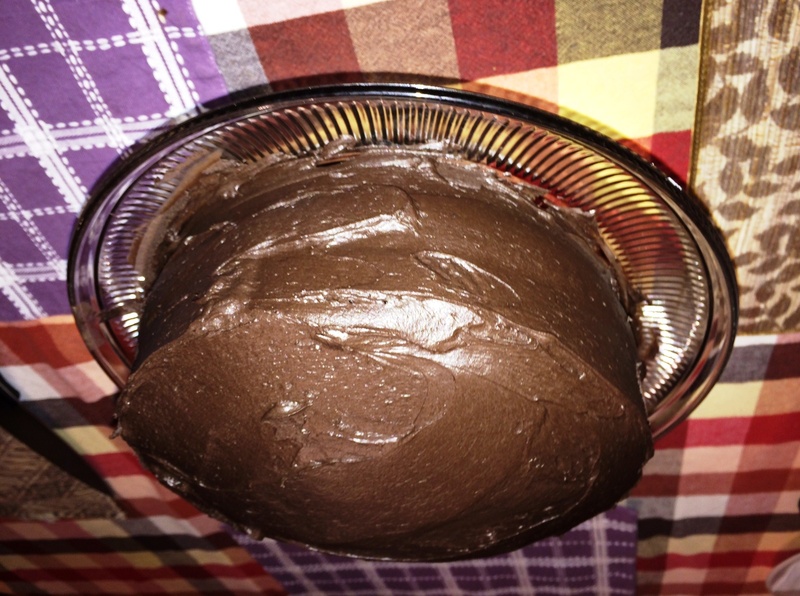 Full disclosure to start: I got this recipe from Hershey’s website, hershey.com – they call it “Hershey’s ‘Especially Dark’ Chocolate Cake,” and it’s a perfectly coherent and usable recipe. I’ve just added my usual goofiness in the hopes that it will make the actual execution easier for any kitten who decides to give it a try – learn from my pain, darlings, learn from my pain. The Evil Genius and I were blessed this past weekend with a visit from two of my beloved aunts from out of town, Kathy from Florida and Neina from Maryland. Magnolia that I am, I always put a cake on the cake dish when we have overnight company, but for them, I wanted to make something really spectacular. I think this fit the bill nicely. I wish I had taken a picture, but it didn’t hang around long enough. It’s so chocolate, it’s almost black, and within 24 hours, it was gone, baby, gone. The next time I make it, which will be soon, I’ll try to restrain myself and the EG long enough to take a snapshot. This uses a very specific product – Hershey’s Special Dark Cocoa. Ordinarily I’m all for grabbing the type or brand of ingredient you like best, but not this time. Unless there’s another brand of super duper ridiculously dark cocoa on the market I don’t know about, this will only work in these proportions with this particular variety of Hershey’s. 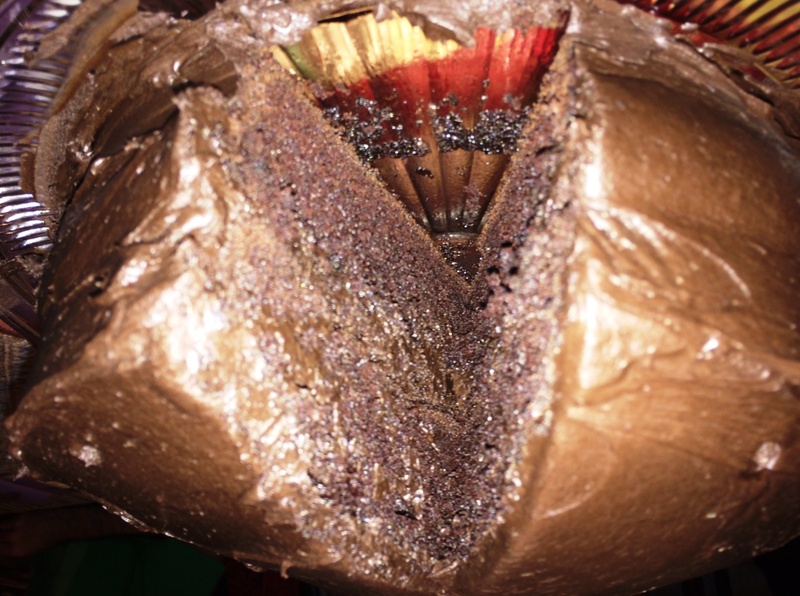 You don’t have to worry about being left with a bunch of cocoa; this uses most of the can, and you’re going to start craving another one of these cakes as soon as the first one is gone anyway. With a wooden spoon, stir together sugar, flour, cocoa, baking powder, baking soda, and salt in a large mixing bowl. Add eggs, milk, oil, and vanilla; beat on medium speed of mixer for two minutes. (Having made a lot of scratch cakes, I was amazed that you could just dump everything in like you would with a cake mix, but you totally can – get your dry ingredients well incorporated with one another first, then just throw everything else in the bowl and use the mixer.) Use your wooden spoon to stir in a cup of boiling water. The original recipe reads that the batter will be thin; I found it a little thinner than a pound cake batter, but not really thin – again, much like a cake mix. Pour half the batter in each pan. Bake 30 to 35 minutes or until wooden pick inserted in center comes out clean. (With my oven, it took exactly 30 minutes.) Cool ten minutes in pans, remove from pans to wire racks, cool completely. Melt butter. Stir in cocoa – I used the mixer on its lowest speed. Notice that it looks remarkably like clumps of damp potting soil – don’t worry; it’s supposed to. Alternately add powdered sugar and milk, beating to spreading consistency – with each addition of sugar, start on low speed so you don’t powder your kitchen cabinets, then turn it up to high speed to get the sugar incorporated. You’ll think there’s no way in East Hell you’re going to get that much sugar mixed into that tiny little bit of milk and chocolate sludge, but trust me, you will. Just keep beating. You can add a few more drops of milk if you absolutely must to get the right consistency, but you’ll be happier if you don’t because the texture is just gorgeous and a dream to spread. Beat in vanilla. This makes about two cups of frosting, which I found to be plenty to frost a layer cake. My sister says this cake reminds her a lot of Chocolate Lovin’ Spoon Cake at McAllister’s Deli, and that is a glowing recommendation. (Though we agreed to really get that, we’d have to double the frosting recipe and put a really thick layer of frosting between the cake layers.) The cake is a bit denser than the usual layer cake, not as delicate, but VERY moist, and it makes beautiful slices. My desserts usually taste divine but look ridiculous; this looked gorgeous. Very definitely worth the effort.